It’s Grow with Google Week in Ohio! Lt. Governor Jon Husted addressed the crowd at the Grow with Google event at the Columbus Main Library. Lt. 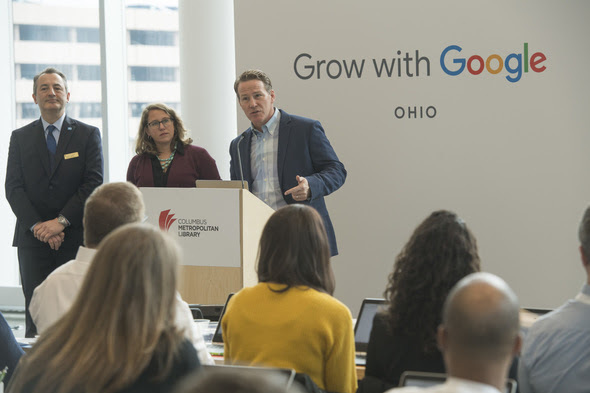 Governor Jon Husted kicked off Ohio’s first Grow with Google event at the Columbus Metropolitan Library on March 18. Grow with Google is on a national tour to help Americans grow their skills, careers, and businesses. In addition to the Columbus event, Grow with Google is providing in-person workshops at the Akron-Summit County Public Library on March 20 and the Lima Public Library on March 22. Even if your library is not one of the stops, you can still take advantage of the free Grow with Google tools and resources available online at google.com/grow and apply for $1,000 micro-grants through the “Libraries Lead with Digital Skills” initiative. Applications are now open for the Libraries Lead with Digital Skills grants. Selected public libraries will receive $1,000 to promote digital skills within their communities. The micro-grants are being launched in collaboration with the Grow with Google national tour. Libraries should submit proposals for community workshops or other training activities that combine their own program offerings with Grow with Google training material, and use current or new community partnerships to increase their impact. Libraries will receive funding for activities that focus on helping job seekers find and prepare for work and those that show small businesses how to grow online. The application for Ohio is available on the ALA website and due by April 15.